Is water being spilled over your laptop? The image on the screen is showing nothing? Important data are in need to be rescued? 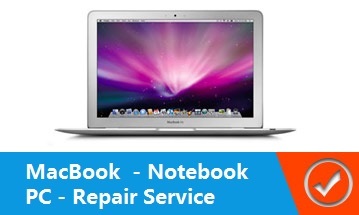 Our specialty is the Notebook Repair in all cases. We are a competent company in Berlin, with experienced personnel for laptops , PCs of all kinds and even MacBooks..
We do free and fast diagnoses. We get new hard-drives and install them for you. We look for a fitting display for your notebook and change it immediately. We repair your motherboard or get the right one for a change. We help you search for a new and individual keyboard. The rescue or to safe lost or deleted data on a separate medium for you. To clean your notebook and it´s fan, to get the machine room to breathe. To free your Mac from Viruses or Malware and to safe it from further infections. .